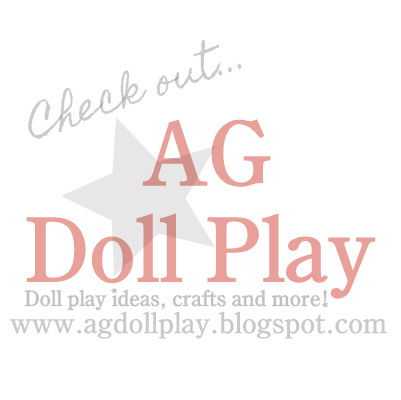 American Girl Doll Play: Weekend Sleepover Fun! Zoey and I got the dolls all set for their own sleepover this weekend...it was Elizabeth's first "official" sleepover since she's been with us so she was the guest of honor and got the top bunk. Elizabeth, Zoe and Bella all got the bunks while the other girls got sleeping bags on the floor. Julie and McKenna don't mind sleeping on the floor at all! Especially since their sleeping bags are so cuuuute! They didn't do all that much sleeping anyways...lots of talking was heard throughout the night. They weren't as bad as Rebecca and Kristen though! Those two were up all night giving each other quizzes from their AG doll Magazines! In the morning the girls enjoyed some breakfast all together, that is...all but Julie. She was still sleeping at 11am! Having doll sleepovers is so much fun! After our doll play fun Zoey and I decided to re-arrange her bedroom which meant her doll stuff got re-arranged as well. I think it's so fun to change things up once in awhile in your play space. It turned out really cute and I think Zoey actually has more room to play in her room now the way we set it up. Hope you all had a great weekend and enjoy celebrating the father figure's in your life! Hi, those sleeping bags are too cute. where can I get them? very fun! I'm surprised they got any sleep at all! super cute awesomeness! Fun! It looks like they had a great time. :) Everything is so cute! Cute !!!! I love the sleeping bags! Where did you get them? So so so cute! I love the bunk beds, bedding, and sleeping bags. Where did you get it all? My sister would LOVE those sleeping bags (she's obsessed with owls.) Where did you get them. The sleepover looks like tons of fun!